Last week, The Academy of Motion Picture Arts and Sciences revealed some major changes coming to next year's Oscars ceremony. The biggest and most splashy of these changes is the addition of a "popular film" category. This is a decision that has been criticized by many and now, the Razzies, an organization dedicated to singling out the worst of the worst in cinema every year, is the latest to voice their distaste. 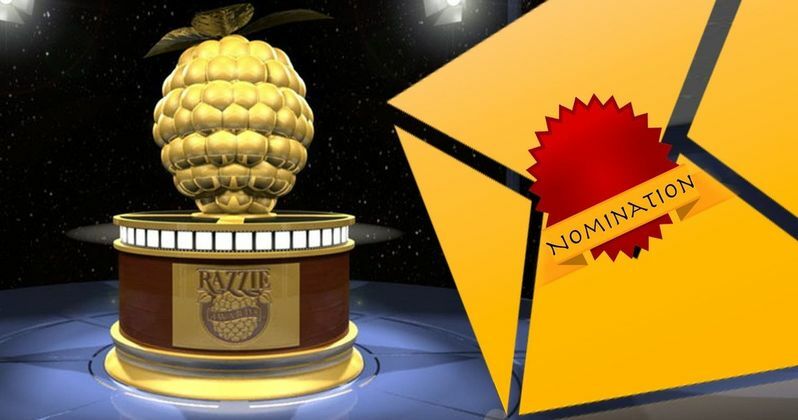 The Razzies, otherwise known as the Golden Raspberry Awards, typically takes place on the night before The Academy Awards and hand out various "honors" to movies and performers that failed in spectacular fashion that year. The organization has published a letter on their website in response to the recently added popular movie category to the Oscars. Here's what the organization had to say. "The Razzies don't always get it right. We get called on it. We usually ignore it because well, who takes the Razzies seriously? But seriously we're not the Oscars. The Oscars are not the low-brow $4.97 statuette that reminds otherwise good talent they done bad or the talent-free they done made too much money." The decision to add the new category came as this year's Oscars telecast saw a massive ratings dip. Much of that was blamed on the fact that a great deal of the Best Picture nominees are not typically movies that do big business at the box office. So, The Academy decided to find a way to honor popular movies by adding in this new category, which could be a way for hits like Infinity War or Deadpool 2 to get some Oscar love. Unfortunately, the decision has proved to be very unpopular as many, including the Razzies, feel this could devalue what the Oscars should be about. "The Oscars lowering themselves to 'honor' popular fare just to get more eyeballs is not conducive to their brand. Everyone depends on Oscar to point out the good stuff that might not otherwise be seen. We sift through bottom-of-the-barrel mindless popular and sometimes unpopular entertainment. The Razzies invite the 'dis-honored' to humble themselves and 'own their bad.' That's our job. So a tip to our older more distinguished bald brother: You are our inspiration, don't fail us now. The Razzies are co-dependent on Oscar. If you are devalued, so are we." There is still no word on what the details of the popular movie category will be and what parameters for the award will be set. In any case, it's likely that studios who release these popular movies, Disney in particular, will be happy. However, many people in the industry and quite a few Academy voters don't feel the same way. It will be interesting to see how this all shakes out as awards season ramps up in the coming months. The Oscars telecast is scheduled for Sunday, February 24 next year. Assuming tradition follows, the Razzies will take place on Saturday, February 23.